With the Heavy’s test flight complete, SpaceX is back to business as usual. Or maybe not. What seems like a routine launch this week may have greater implications for the company’s future and profits. The launch’s primary mission is to deliver Paz, an observational satellite heavily financed by the Spanish Ministry of Defense, from the company’s pad in California. Paz won’t be riding alone on its recycled Falcon 9 though; SpaceX quietly loaded two experimental broadband satellites—built in-house—atop the rocket. Falcon Heavy may be the most powerful launch vehicle in the world, but its size and capability translate to a meager share of profits SpaceX envisions for Starlink, its space-based internet venture. The company hopes the first two tester satellites, Microsat-2a and Microsat-2b, will be the predecessors to a fleet of thousands of broadband satellites that SpaceX will launch over the next decade. 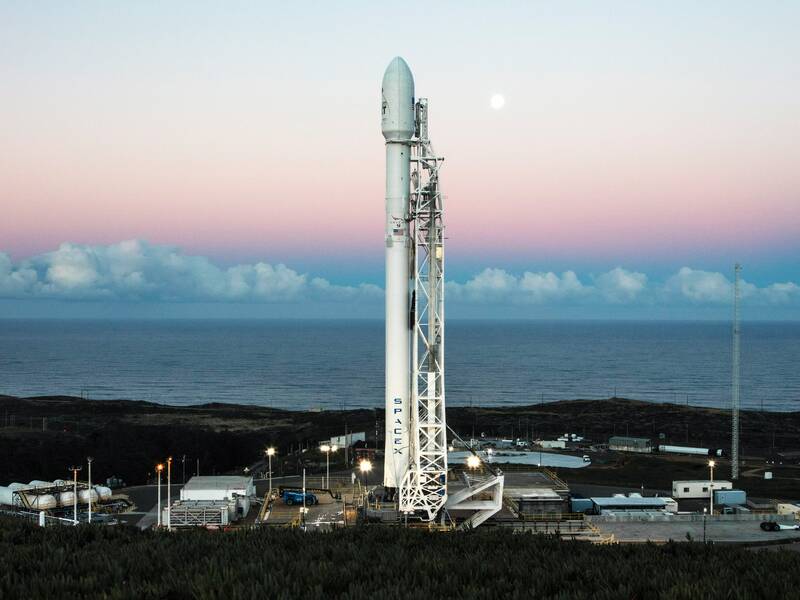 SpaceX is targeting an instantaneous launch window at 6:17 AM Pacific time on Wednesday and the booster, an older Block 3 Falcon 9 model, will be discarded in the ocean after its flight. Following the company’s last commercial satellite delivery, GovSat-1, SpaceX experimented by firing the Falcon 9 engines at a high thrust right before crashing it in the water. Remarkably, the booster survived and was left floating—so SpaceX may attempt this test again after the Paz launch. While SpaceX made no official announcement about its secondary payloads, the Federal Communications Commision issued experimental licenses to the company to conduct the mission. The company wants to place 4,425 of these small spacecraft in low-Earth orbit—between 600 and 800 miles above the Earth’s surface—and hopes to officially begin doing so next year. Then, SpaceX wants to create an even larger constellation of over 7,500 of its satellites just 200 miles up which could help make them good on the pitch: making high-speed internet accessible anywhere on the globe. In a filing to the FCC, SpaceX explained that the experimental microsats being launched will help the company prove the basic infrastructure of the small spacecraft is sound and that the electronic systems housed inside work properly. Most importantly, in SpaceX needed the ability to test ground-to-space communications. The FCC granted the license, which highlights one significant component to the plan: The satellites will not be in a fixed position in orbit. In order to provide the coverage they are selling, SpaceX will have to constantly shift and synchronize thousands of these spacecraft as they zoom around the globe. The company’s goal, according to projections obtained by the Wall Street Journal, is to have subscribed over 40 million customers by 2025, which would amount to nearly $30 billion in total revenue. SpaceX could potentially milk that even more if it decides to enter the growing Earth-imaging market or find other tasks for its satellite fleet. The company previously applied for a NOAA license which would have allowed SpaceX to install a video imager to its prototype internet satellites. The plan was scrapped when the prototypes were redesigned, and no second NOAA application was filed for Microsat-2a and Microsat-2b. SpaceX isn’t the only company hoping to get a piece of the billion-dollar broadband market. OneWeb, which is currently building its campus just down the road from SpaceX at Kennedy Space Center, plans to start building a constellation of 900 broadband satellites next year. The company is contracting Soyuz, Blue Origin’s New Glenn, and Virgin Galactic LauncherOne to carry batches of its spacecraft to orbit, none of which will be prototypes. Boeing is reportedly also entering the space internet market. Facebook founder Mark Zuckerberg created an initiative called Internet.org which would help bring free internet to undeveloped nations by partnering with telecom firms like Qualcomm and Samsung. But the program has since come under fire for reportedly violating net neutrality—by serving websites and content that benefit Facebook and its partners. Zuckerberg intended to utilize a satellite, the Amos-6, to provide coverage over parts of Africa, but his plans came to a screeching halt one day in September of 2016. Amos-6 was destroyed when its ride, SpaceX’s Falcon 9 rocket, exploded on the launch pad before the mission got off the ground. Regardless, the project amassed 40 million users by late 2016, showing that the almost 4 billion people on Earth without readily available access to the internet are eager for options. With SpaceX making advancements in cheap rocketry, it’s not a stretch that they could take advantage of the cheaper market they helped to create. The cheaper it is to launch an internet satellite, the more you can launch. The more internet satellites you have in orbit, the more subscribers you can reach. It’s simple math for SpaceX; considering it’ll need every penny to realize its Mars ambitions, a few billion in internet revenue couldn’t hurt. Oh, and then there’s the kookoobananas plan to transport humans between Earth cities on rockets. Sure, man, sure.